Here you can order a high-quality crossbar for your Land Rover Defender. Made of a lightweight and stable aluminum-magnesium alloy. ✔ completely made in Germany ✔ low weight ✔ favorable alternative to the whole roof rack ✔ sets with price advantage. Furthermore, two or three brackets can be upgraded by buying the missing parts to a full CargoBear roof rack - this is just the advantage of the modular system carrier! Of course, numerous accessories for the CargoBear roof rack with the crossbars can be used. Please note the price advantage when buying two or three of the load bars! 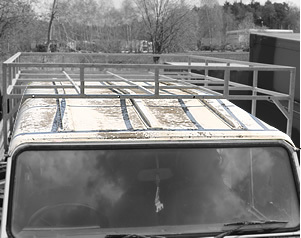 The CargoBear roof rack / crossbar can not be installed on defenders that have a ribbed roof (see photo). An approximate indication of the series is between 1983 and 1989.